Pests threaten the hard work that gardeners have put into their yards. While there are many pesticides available on the market for combatting these unwanted creatures, many artificial formulas also endanger the environment, animals, and humans. Thankfully, individuals mindful of these dangers have developed other ways to eradicate aggressive insects safely. Acting as a physical barrier, a floating row cover is dense enough to shield plants from flying insects, but translucent enough to expose the vulnerable crops to 80% of the accessible sunlight. Summer and winter varieties are available, the former being lighter, the latter being heavier—a perfect weight for locking in heat. Cut the sheets until you’ve obtained the size that you need. There are several methods of set-up: drape your cover over metal rings, fasten it to wooden supporting frames, bind it around wire tomato cages, or save time by delicately laying it over your plants directly. Once the cover is in place, keep it there with materials capable of fastening it or holding it down. Covers can prevent plants from being pollinated, however, so only use them when necessary. Plants are most vulnerable when they are seedlings or their specific predators are most active. Interestingly, there are insects that are attracted to particular colors. Some of these insects are also pests, conveniently. Choose sticky traps whose color attracts the pests that are the biggest problems for your garden. The insects will get stuck to the adhesive, so make sure that the rigid material used is clean and tacky. Place at least one trap every three to five feet, situating them close to the vulnerable plants, matching them in height. Sticky traps can be purchased or homemade. Insecticidal soap only works when it is sprayed directly onto pests. Try to avoid showering productive insects with the soap in the process, however. The soap can be harmful to some plants as well, so test it on their leaves first before coating them. To test a certain variety, mist a few of its leaves with soap, then wait 48 hours. If no damage has been done, it’s safe to spray that type of plant. 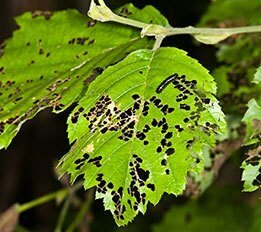 There’s a greater chance of the soap burning leaves when the sunlight is particularly strong, so refrain from applying insecticidal soap on hot days. If the sun does come out after plants have been exposed to the product, wash their leaves off. Households with hard water may want to dilute the soap with distilled water to increase effectiveness. To protect yourself, always wear goggles and a mask when applying sprays and dusts. Insecticidal soap and oil sprays are used in a similar fashion; aggressive pests are showered with solution directly. There are two types of oil spray: heavier “dormant oils” are useful when—you guessed it—plants are dormant, while growing plants benefit from lighter, more refined oil (labeled “summer,” “supreme,” or “superior” oil).Growing plants. If oil stays on growing plants too long, it can damage them; lighter oil evaporates more quickly than dormant oil does. The cautionary notes that apply to insecticidal soap also apply to oil sprays. Bacillus Thuringiensis (BT) is a soil-inhabiting bacteria found in nature. There are various types of BT, which eradicate various types of pests, so choose the one that is most appropriate for your specific problem. You can also choose from different forms of BT, including liquid, wettable powder, dusts and granules. Timing is of the essence when it comes to BT because it doesn’t affect adult insects. Look for larvae, and cover the afflicted plants with BT. In the case of severe infestations, reapply the spray or dust, since it may have lost some of its potency by then. Like BT, parasitic nematodes already live in the soil and can be deployed as organic means of pest control. Apply water to a container of these roundworms then apply them to moist soil as soon as possible, in the evening or when it’s overcast. Water them in again, and they’ll begin to work their magic.